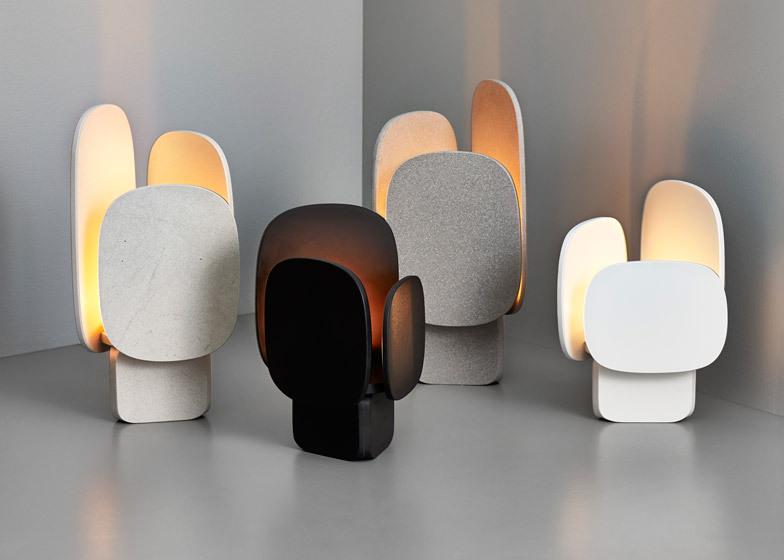 Stockholm 2015: Swedish designer Monica Förster has collaborated with Spanish company Cosentino Group to form a collection of outdoor candle holders and trays using new synthetic stone material Dekton. Monica Förster's Moonlight and Traylight products were launched as part of an installation at Bianchi Café & Cycle during Stockholm Design Week earlier this month. The candle is placed at the centre of Moonlight's three surrounding panels, each of which is a different size and therefore obscures to a differing extent, depending on which panel is closest to the user. "The idea for this family of outdoor torches in two sizes has been to play with shadow and light," Förster told Dezeen. "The result is a sculptural torch holder full of poetic feeling." "Moonlight is made of three differently shaped sides which interact with each other," added the designer. "This creates a movement that makes the object look different depending on which angle you are watching it from." "By turning the torch holders in different directions, it's possible to create infinite variations within the world of illumination." Moonlight is made of Dekton, which comprises a mixture of the raw materials used to manufacture glass, porcelain components and quartz surfaces. The elements are compressed using "sinterised particle technology" – an accelerated version of the metamorphic change that natural stone undergoes when subjected to high temperatures and pressure over thousands of years. The resulting highly compact material is free from the tiny defects that can cause weaknesses in natural stone. Water cutting and CNC milling was then used to form the products. "Dekton feels like a hi-tech, futuristic material," said Förster. "The material's unique qualities – its resistance to heat, thermal shock and the fact that it is ultra compact – makes it a very exciting material for me as a designer to explore." Traylight – a collection of trays with an integrated tealight holder – also uses Dekton. "In Scandinavia the use of candlelight is part of the culture and tradition," said Förster. "We have therefore created a collection based on these qualities, and designed Moonlight and Traylight for indoor and outdoor environments." Cosentino Group offers both the trays and the torches in thicknesses of eight and 12 millimetres, and in four colours: "irok", "zenith", "domoos" and "sirocco". The products will be relocated to the Bianchi Café & Cycle in Milan for the city's design week in April.